Welcome fellow Vette enthusiasts! Listed in our product pages you will find some HOT products geared towards making your Vette perform at it's peak, and look great doing it!! If you don't see what you are looking for or have a question about our products, just drop us a line. We'll help as best as we can, or try and point you in the right direction. We're proud of the products we offer and excited about the results our customers are experiencing by using them. All our products are guaranteed to ensure your satisfaction! Make sure you stop by our message board to chat with other Vette enthusiasts. We look forward to serving your needs. 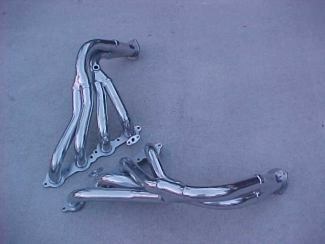 These one Piece Tri-Y headers are constructed of 1.75" steel, have 3/8" thick flanges that will not warp, internal "pickles" for increased scavenging, three bolt flanges and then are ceramic coated inside and out for a beautiful finish that will last and protect the headers for a lifetime. Oxygen sensor wires do not need cutting as they fit very close to the stock locations. 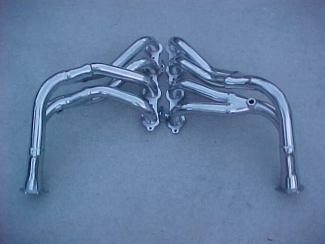 The headers come complete with all gaskets and hardware, and complete installation instructions. They can be installed by the do-it yourselfer with normal shop tools. This simple bolt on will enable your LS-1 corvette to rival any stock Z-06 for thousands of dollars less! The car does not sound any different but the power is definitely there as evident in the two tickets shown. We made 10 passes in each configuration to make sure that consistency was not compromised. We know that there are many choices on the market, but when you compare PROVEN performance for the dollar spent, there is not a better header anywhere! This system is designed SPECIFICALLY FOR THE LS-1 CORVETTE, not a generic kit that requires several trips to the hardware store to fit your car. at the Dyno sheets. NOTE how RICH the mixture ran(10.0 air/fuel is the bottom-rich of the scale). This is conservative off of the scale! The car would have made A LOT more HP should we have elected to Lean out the Air/Fuel ratio to 12.0 which is the norm for nitrous applications. The following timeslip shows what OUR OWN car ran with the nitrous and propane flowing. The car is the same one as above and used the TRACTION CONTROL with stock Run Flat tires.